King Candy: [puts on glasses] You wouldn’t hit a guy with glasses would you? We’ve gone to screenings at the Premiere Theater at ILM, the Century 9 at the San Francisco Center, and even both studio theaters at Pixar, but we had never heard of the Variety Screening Room before. It’s at 582 Market Street which is super convenient by public transit, so we decided to check it out (even though we ended up driving due to threat of rain tonight!). 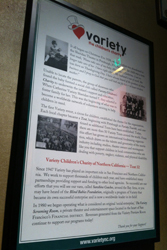 The screening room isn’t a movie theater in and of itself, and we learned it’s actually a part of the Variety Children’s Charity of Northern California, which support the needs of disabled, critically ill and disadvantaged children without proper access or coverage by insurance, hospital services or government agencies. The screening room and lounge is operated to further generate funds for their operations, and is in the Hobart Building. 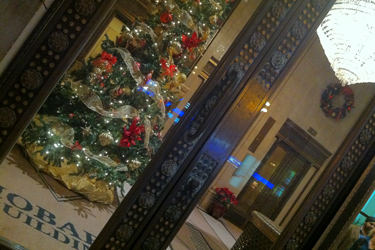 Just after you walk in, the lobby/lounge to the screening room is past the elevators, to the right. 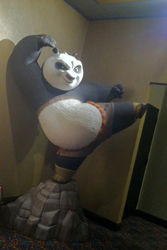 They have a statue of Kung-Fu Panda! Rad. 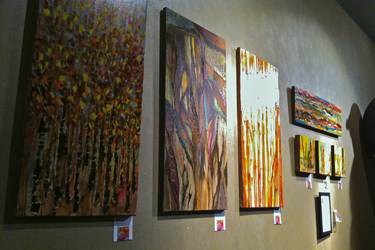 There is also beautiful artwork on the walls that people can purchase to help support the organization. 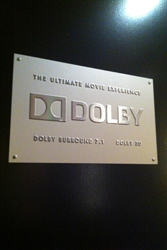 The screening room itself is a cozy, 47-seat theater, with Dolby surround sound and as we discovered tonight, Dolby 3D capabilities – our invite had led us to believe this screening was only 2D! Score! 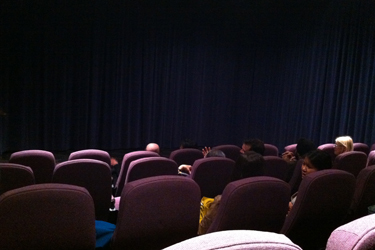 We thoroughly enjoyed watching Wreck-it Ralph at the Variety Screening Room. 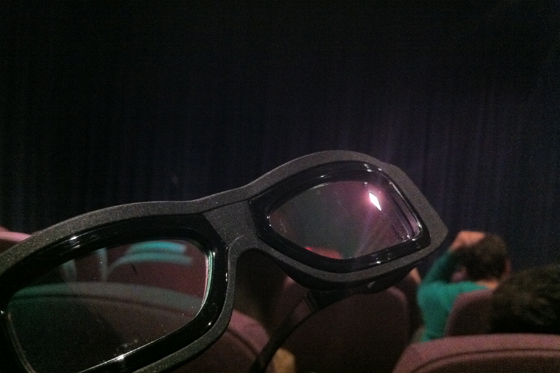 The smaller theater with superb sound and visual setup made this experience all that much more engaging. I am so glad we had to pass on the earlier screening of this film (in a different location) so that we got a chance to see it here. The rental rates for the screening room are a ridiculously great deal for the quality of the space, the location, and the great cause you are supporting by holding an event here. I highly recommend this place, and can’t wait to visit here again. You’ve also seen a movie in the Dolby theater too, right?